Tonight, the almost-full waxing gibbous moon sits close to Spica, the brightest star in the constellation Virgo the Maiden. 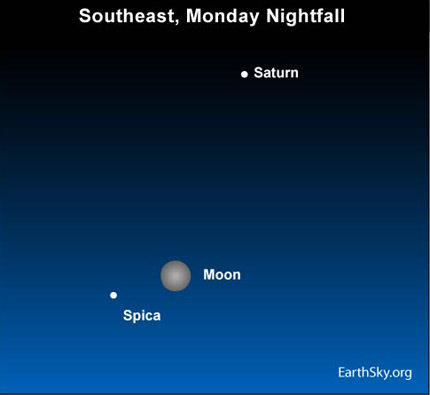 The star-like point of light above the moon this Monday evening is actually no star at all but Saturn, the 6th planet outward from the sun. Although the moon pairs up with Spica for only a day or two each month, you can always use the Big Dipper to star-hop to Spica after the moon goes down the pike. Once you find Spica, you can locate Saturn’s place in the night sky. The ringed planet bejewels the head of Virgo the Maiden until July of 2010. Whereas the moon is our closest celestial neighbor, Saturn wins acclaim for being the most distant world that we can easily see with the unaided eye. The moon stands about 230,000 miles away from Earth tonight. In contrast, Saturn lies some 3,500 times the moon’s distance from Earth. When speaking of stellar distances, though, Saturn is only a stone’s throw away from Earth. Saturn resides at 9.5 times the Earth’s distance from the sun – or 80 light-minutes away. Yet, the star Spica lies out there at a whopping 260 light-years away. That is about 1.7 million times Saturn’s distance from the sun! Site contents copyright © 2019 Recorder Online	except as noted. All rights reserved. | 88 queries in 2.467 seconds.